Incarnation trailer from Jinga Films on Vimeo. Matchbox and Jinga are pleased to announce the UK DVD / VOD release of Filip Kovacovic's sci-fi action thriller "INCARNATION" which critics have described as Source Code meets Looper. 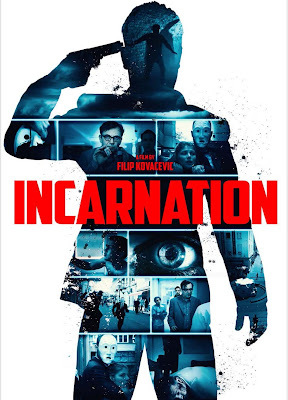 "INCARNATION" follows an man suffering from amnesia who finds himself the target of a relentless gang of assassins. But each time they kill him, a time loop takes him back to the beginning and he is given another chance to survive the ordeal and discover his identity. "INCARNATION" received its World premiere at ScreamFest LA and has since travelled the festival circuit with screenings at Raindance, Cottbus and Fantasporto.